ANT+ compatible to Garmin equipment (Forerunner etc.) as well as TOMTOM , Polar etc. Heart rate monitor with energy saving Bluetooth Smart technology for wireless heart rate transmission. 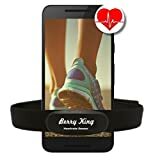 The Berr King Heartbeat 2016 heart rate sensor enables the users to read their heart rate live,and in real time on the mobile training application. The Heartbeat enables users to view the exercise intensity during the workout to analyze later and to share; by Bluetooth Smart the heart rate data from the heart rate sensor are wirelessly transmitted to a mobile product training application in the smartphone, tablet or any Bluetooth Smart Ready, and by ANT + technology to Garmin, TomTom or other sports equipment. The battery of the heart rate sensor lasts longer; with soft textile belt with hooking mechanism for complete freedom of movement during training and even changeable battery for enhanced usability; the heartbeat sensor 2016 is compatible with the coded 5 kHz transmission with most training computers. In addition the BerryKing Heartbeat 2016 is waterproof and therefore perfect for a triathlon.